Today's recipe is dedicated to my San Francisco Giants! While yesterday was a little disappointing I have complete confidence that we have made it this far for a reason. My Giants have TALENT! And they are in it to win it! 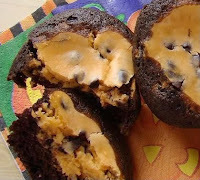 Whats nice about this recipe is that the Giants color are also the colors traditionally associated with Halloween. Let's hear it for the orange and black! 1 (8 ounce) package cream cheese, room temp. 2. Filling: Beat together cream cheese, egg, sugar, and salt. Add chocolate chips. 3. Batter: In a large bowl, sift together flour, sugar, cocoa, baking soda, and salt. 4. Stir in water, oil, and vanilla. 5. Fill 15 cupcake liners 1/2 full with chocolate batter. 6. Drop 1 heaping teaspoon of cream cheese mix on top. 7. Bake 30 minutes. Remove to cooling racks to cool completely. LETS HEAR IT FOR YOUR SAN FRANCISCO GIANTS! They worked perfectly! Now, that is what I call being clever!! Glad you liked them.